I realised that the weekend's baking only produced enough bread to see us through the first week of our Easter holiday. It is possible I could do some baking next week, up in the North West of Scotland, but I do not want to be beholden to that. This is one made by SteveB: http://www.breadcetera.com/?p=423 which Eric blogged on not too long back, here: http://www.thefreshloaf.com/node/19548/taste-tahini See Steve's post for the recipe and formula. I made one or two alterations, but stayed sufficiently close to the recommended recipe and instructions. Instead of using King Arthur All Purpose flour, I used Carrs Special CC flour, but included 5% Coarse Semolina to give more bite to the loaf. I also increased the pre-fermented flour from 16 to 20%. The bulk proof time was shorter, at 2 hours, but it was hot and sunny here again today, and I put the dough out in the sunshine, covered. 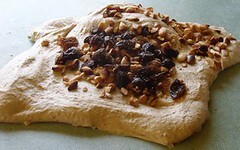 The dough mixed up strong, as seen in the photograph. I was a little disappointed with the shaping of the final dough, and the result in the finished bread. I guess fendu shapes work best with oval brotform, and I only have a round one. Anyway, the split made in the dough piece with the dowel pin ended up completely lost. The finished dough texture was really pleasing. 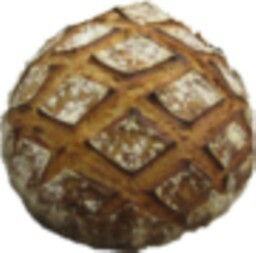 As regards taste, I found the bread to be very much as described in Steve's post. Thank you to both Steve and Eric for posting on this in the first place. 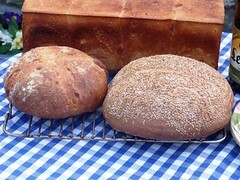 There are also some photographs below showing the finished loaves. Notice the high volume achieved in the bread, and the lovely moist crumb. This is far too open for the type of Sandwich bread sold in UK supermarkets. However, it is exactly what I had set out to achieve using a lengthy fermentation procedure, including a stiff levain, and just a tiny amount of dried yeast in the final dough. Some photographs of this very dramatic bread are also attached below. The flavours in this are just amazing. I made a really small batch of scones as an afternoon treat to have with a pot of Green Tea. This is based on the formula I tweaked recently when mentoring Kieran in the Scone entry for the NECTA Competition. We had a lovely fruit and nut mix in the house, including pistachios, pecans, almonds, brazils and cashews, as well as raisins, golden raisins, cranberries and sultanas. I added some chopped stem ginger as extra good measure. Ordinarily I mix scones using 60% soft flour, and 40% strong flour. As I only had strong flour in the house, I used a small proportion of light rye flour to reduce the gluten content. I also used the baking powder kindly supplied by my colleague Dinnie Jordan, who owns Kudos Blends, and is a specialist on chemical aerators. These scones are soooo light: many thanks Dinnie! Add this to the crumb and combine until just clear. Roll out on a lightly floured surface and cut out the scone shapes. Lovely assortment of unusual breads, Andy! The tahini bread looks particularly good to me, at the moment. I've not shaped an oval fendu, but I've seen photos. I prefer the appearance of a boule fendu. This is a wonderful formula too. One of my students made Hamelman's Roasted Potato Bread last year, and it was fantastic. Mashed potatoes are a great way to keep bread moist, for sure. I think I went wrong when putting the dough piece into the banneton. The split in the middle got lost at that point. Maybe because I'd use water sprayed on the surface to stick the sesame seeds? 3. Sprinkle the split area with rye flour (to prevent sticking). 4. Dampen the loaf by rolling in wet toweling (rather than spraying) while holding the split together. 6. Place in banneton, proof, bake. I bet this would maintain your split and would look wonderful when baked. I think that a dust of flour in the split is all it needed. I like to spray the loaf surface, as it means I'll get more seeds to stick. If I'm having seed-topped bread, then that's what I want. A few scant poppy or sesame seeds atop a loaf just annoy. Either crunchy seed, or, not at all. 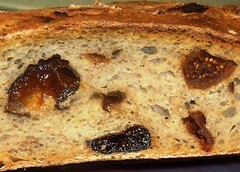 The almond, fig, prune bread is calling my name. This was Alison's description shortly after it came out of the oven. So we sat on the patio and ate it for breakfast. That was really fine, in the sunshine, as Alison said it was one of the best breads I'd made. For all the tahini dough was strong, it did not work in the proof stages as well as I had hoped. The finished bread was therefore very pleasing. The scones were lovely. Yes, I've read Debra's great post on baking powders. When I was at College, I had to do a detailed research piece on a key raw material used in baking. I visited Dinnie Jordan at Kudos Blends for a whole day, and had access to some brilliant research on the principles of chemical aeration and the base compounds used. I'm not an amazing chemist, but I thoroughly enjoyed the research topic. Mmmm, what a wonderful array of tasty-looking breads you've baked! You've been busy, too! What a bubbly crumb on your tahini bread, and it looks like you've got a nice crackled finish on that crust. I am now curious to try tahini in bread dough, as an enhancement to sesame flavor. I love what you've done with flavors for your cheese bread, combining the cheeses and adding in some rye flour. I bet the Manchego cheese tastes fantastic in that bread. Do you think the paprika adds flavor, as well as color? Thanks so much for the 'video extra' showing the shaping for 4-piecing! Your toasted almond, fig and prune bread looks just wonderful with all of those beautiful pieces of fruit and lovely scoring. Your fruit-nut-and-ginger mix for the scones sounds great too. Wow, Andy! Thanks for all of the mouth-watering ideas, and video instruction! I coated the tahini bread with sesame seeds, which is what you can see atop the loaf in the photograph. For the paprika, I totally agree that it introduces a lot of flavour as well. I would have added some mustard powder too, but didn't have any in the kitchen. The paprika is just ordinary, although some Hungarian, or, yes, better yet, Smoked Spanish would have been all the better. 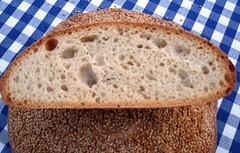 But actually, Khalid has it below; it's the crumb texture that I so love in the resulting bread! Yes, the huge fruit and nut loaf is special; Alison is not a "bread freak" like me, so getting compliments from her means it really is a good loaf. I'm so glad you liked the videos. Andy, those look wonderful.. ! Indeed, the Ceese bread got a substantial ovenspring, and the crumb structure is open! The Tahini bread has an open cell structure! Lovely, fendu or not. And the fruit bread.. this must carry tons of flavor.. i admire your baking skills. The vidoes are very helpful too, Andy! I hope you enjoy your vacation, you deserve one! I've thoroughly enjoyed baking at home, on holiday in the sun this week. I have some meetings to attend tomorrow in York, then pack on Friday. NW Scotland here we come! Taking the bread with us, of course! 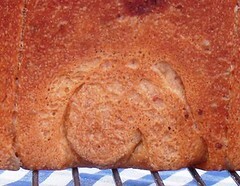 Thanks for letting us know for the tahini bread, fendu shape is more suitable for the overall bake appearance. I was eying the recipe for long time but I have no spare time to bake so many breads on my lists in my busy schedule. I like your cheese bread being baked in Pullman loaf pan. Your fruit scone is on my lists for the coming brunch preparation, can I substitute partial milk for the water portion since I don’t see Skimmed Milk Powder in my grocery store. Thanks. Just use milk instead of water, that's fine. Milk powder is just so much more convenient in a commercial bakery! The scones are easy! The range of breads came from preparing plenty of leaven, and the ingredients in the kitchen at the time...oh! I'm also grateful to Alison for bringing home an extra bag of bread flour at short notice!!! Given I had over a kilo of good leaven, plus flour Alison brought home specially, and a great array of ingredients in the kitcken to use up, I just couldn't resist. 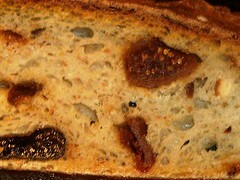 The fruit and nut is very much based on Hamelman's Hazelnut and Prune Bread. I'm loving taking more outdoor photographs. Now there is some good weather and our patio is such a joyous place to hang out. I really should thank Khalid, as he is the one who encouraged me to get more natural light into the photography. Let's hope this weather continues! I'm very intrigued by the way you incorporated the fillings into the dough. I don't think I've ever seen anyone doing that way nor have read any book suggesting doing so. Can you please tell me the reason/merit of your method? Wouldn't cutting the dough so many times damage gluten strengh, resulting in less voluminous bread with dense crumb? Especially with bread with lots of fliings, I've always thought it's very important to develop gluten very well, strong enough to withold the weight of fllling. Beautiful breads and really nice videos of your shaping techniques. It's true, a picture is worth a thousand words, and a video...even more. Larry, it's so good to hear from you and thank you very much for your assured and sound comment. I know some of my words are pitched towards the "industrial", but I have to direct my teaching materials at a number of different audiences. I hope I have succeeded, and it is so good to have positive feedback from a pro such as yourself. Thank you for asking such an interesting question. I appreciate you may not have come across this technique before, but assure you it is a method handed down by skilled craft bakers through the years. Imagine this scenario: you have some dough, say 5kg, sitting fermenting in bulk, covered on the bench. It's been resting for half an hour. You cut off a piece randomly, say 500g, and then pitch this piece back onto the top of the fermenting mass, then cover it over and leave it again for half an hour covered. Then go back and take the cover off. The piece of dough will more than likely have melded back into the mass of dough. What method do you use to incorporate fruit into dough? If you use a machine, and the dough is fully mixed, then there is obvious risk of the fruit becoming pulverised as it is so difficult to work it into the dough. If you try and incorporate it into the dough by hand using a sort of "kneading" technique, then the dough will tense up very quickly, and it will become very difficult to incorporate the fruit at all. I know it doesn't look like it, given the vigour you see me working, but, actually cutting through the dough like this is the gentlest way to incorpoate fruit without 1] damaging the fruit, and 2] putting immediate tension on the dough causing the gluten to tighten up instantly. With regard to levels of gluten development, I fully agree with you. I have posted numerous times emphasizing my preference for properly developed dough, for numerous valid reasons. Holding high levels of fruit would be one of these. But cutting through dough like this does not damage gluten strength! If it does then I feel the reason is simply that too much bulk proof has been allowed before adding the fruit, and the gluten has become too softened by the reduction in the dough induced by fermentation. So, the key is to add the fruit at the right time....regardless of what method is used to incorporate it; I just happen to find that cutting it in is the quickest, most effective and the gentlest, in terms of minimising damage to the fruit. Damaging the dough doesn't really come into the equation, so long as the dough has been allowed to rest so the gluten can become relaxed, but not allowed to ferment to the extent that dough rheology is seriously underway, and the gluten has become overly soft. Sorry, this seems quite a complex answer, but I hope you can appreciate my explanation. Same technique as we use to make 'monkey bread'. No damage to the gluten structure of the dough. Yes, I've seen artisan bakers cutting off a chunk of dough and put it back on main dough as a way of 'folding' but have never seen anyone doing it with one piece of dough which is going to be ONE loaf. What method do you use to incorporate fruit into dough? I usually use letter-folding technique to fold the fruits in. Like many of TFLers, I almost always 'stretch=and-fold in abowl' instead of properly kneading a dough (except for when I make bagels, which needs serious kneading), and I do one set of 'letter-folding' instead of S & F just before I feel the gluten is almost sufficiently developed and incorporate the fruits then; spreading the dough on a worktop and scatter 2/3 of filling to 2/3 area of dough, then letter-fold, a part with no filling first, then the part with filling on next. Then spread the folded dough a little and repeat the same process with the remaining filling and put it back to the bowl, seam side down, and rest until the last S & F (or another letter-folding, depends on the condition of dough...and my mood. :p) session. Thanks for passing on a clear explanation of your process. Yes, it should work very well. I just thought I can now give further guidance about timing for incorporating the fruit. You are basically combining in the last stages of your mixing process. This method I use allows me to fully develop the dough first. And I make the dough soft enough so I know I won't need to make any adjustments when I come to add the fruit. Adding waater at that stage can be a bit counter-productive. But the short bench rest allows the dough to relax, and seemingly take up some more of the lquid, so the dough is less sticky and not so overworked. This means the fruit is relatively easy to cut in. 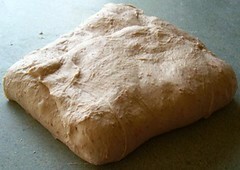 Personally, I always found it difficult to fold in at the end, because the dough was so taut from all the mixing. That said, I do use several different techniques now when mixing dough, and most of them are more vigorous than the stretch and fold method. Thanks for your prompt attention, Andy. This method I use allows me to fully develop the dough first. And I make the dough soft enough so I know I won't need to make any adjustments when I come to add the fruit. Adding waater at that stage can be a bit counter-productive. Sorry, I didn't mean I 'tweaking' by adding water (or flour) at the last stage of dough-making if that's what you thought. That's something I never do whatever a bread I'm making. I only adjust the way the filling is incorporated into the dough to make sure it's evenly distributed. Personally, I always found it difficult to fold in at the end, because the dough was so taut from all the mixing. Yes, I've found that, too, and that's why I started using the above method. The dough's been resting for a while since the last S & F session, so it's relaxed enough to 'receive' the filling and also the last S & F / letter-folding session after a period of resting makes it much easier to handle the dough in a way I need to. Also, I almost always cold-ferment in a fridge for a long time (either at the bulk fermentaion stage or at the final proof stage in a banneton), so the filling seems to 'bind' with the surrounding dough quite well during that period. This is much more critical in College classes where I would be teaching yeasted enriched products such as Hot Cross Buns[! Happy Easter!] made with a ferment. I'm all for encouraging the use of bread machines, lumos. Especially the ones like yours with the long fermentation cycle. 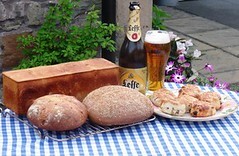 Providing fresh bread, homebaked is an integral part of kitchen output in my brother's B&B business in the Dales. His bread machine is what makes that possible. For me, a bread machine is a means to allow people to avoid having to buy all their bread from supermarkets, etc. If having a bread machine then encourages people to do more of their own "hands on" baking at home, then, all the better. So, I'm generally very positive about them...so long as they get used, and don't gather dust at the back of the cupboard! I reckon we add the fruit to the dough at a similar time, having read your comments. So, yes, just try cutting it in, and see if it works for you. For Hot Cross Buns, note just how soft my dough is: very! I encourage students to make a mixing bowl full, so they can practice lots of skills on the bench. This equates to 3kg of flour in the formula. This gives just short of 9kg of dough, or, 136 Hot Cross Buns. I like to keep them busy!!! Go on Larry, what's "monkey bread"? I've not heard of that over here! Thanks for posting this lumos. Have I explained use of cutting fruit into the dough sufficiently well for you? and thank you for the videos. Highly inspiring. It is great watching the dough gain shape under your hands. And I get clues why it not always does under my hands. I should take this opportunity to thank my wife, Alison, for filming these videos. She did a really good job, in my opinion. Ah, I see you're putting your much needed vacation time towards some recreational baking and good on you! Hard to decide which one I like above all three but I'm leaning towards the Tahini loaf. Honestly, I think they're all wonderfull but the Tahini loaf hit's a note with me for it's flavour profile. This is the very first scone formula I've seen that includes a rye flour in the formula. Sounds like something I'll have to try next time I make a batch of scones. Our favourite is the jumbo fruit and nut loaf!!! We're away early tomorrow, but I'm taking my netbook away. I reckon you'll have been bashing out Hot Cross Buns all week, no? Really glad you caught this one; I know how rapidly TFL traffic flies on by these days! ps. I don't normally do scones with rye flour. It was just my way of trying to weaken the flour blend, given I only had access to strong white flour at the time. Ordinarily, I do 40% strong and 60% soft, with BP at 6-7% depending on the agents being used. Poor choice of word Andy, sorry.They all look excellent but I really like the Tahini bread. The hot cross bun ordeal is almost over for another year thank goodness, and something our whole crew will be happy to have behind them. Have a safe trip and a great time in Scotland! Another new trick technique to add to my repertoire of baking skills! Thanks for the post and the video! Good, I'm glad it worked out for you. It should be failsafe, and is much more gentle on the fruit than using a mixer.